Boulevard Brewing really is a somewhat underrated ale factory that, in recent years, has gained some well-earned acclaim for the entries into its Smokestack Series of big beers. The Kansas City brewery can really be summed up in a word: dependable. I’d had this beer one time before and it made a good impression, so I picked up another one as part of a mixed six pack. Having just finished it, I wish I had picked up even more. NOTES: 12 oz bottle, poured into a tulip. 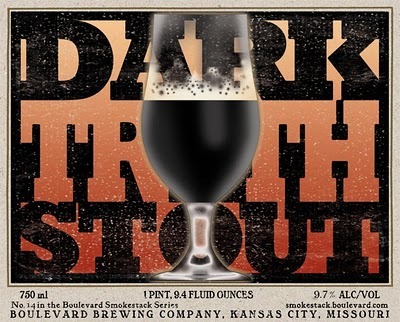 Note THIS: “Dark Truth” is a totally boss name for a stout. Awesome label too. APPEARANCE: Black, black, black. Lots and lots of latte-colored foam on top. Much more carbonated than most imperial stouts, actually had to let it settle before pouring the rest. NOSE: Very roasty with some booze. Definitely on the roasty side of the roast vs. sweetness matrix. I don’t really smell any hops here. TASTE: Very roasty but also very rich. A lot of fruity flavors, like dried berries or raisins. The alcohol comes through less in the flavor and more in the sensation of heat traveling all the way down from the throat to the stomach. A comforting feeling that “yeah, I’m drinking booze, WHAT OF IT? ?” The text on the back of the bottle says this was fermented with a Belgian yeast, but it’s not immediately apparent. It may be the factor that causes the high amounts of fruitiness, but it comes through in that way and not in stereotypical Belgian funk or spicy character. Quite dry for an imperial stout, much more than most 10% beers. I don’t know if I’ve ever had one combine this kind of roast character with this kind of fruit character. Very little in the way of hops to be found. MOUTHFEEL: Very smooth and velvety, but rich drinkin’. A dessert beer. DRINKABILITY: Actually quite high, for a beer this strong. The combination of dry roast and fruit keeps me reaching for more. SCORE: 3.5 hops. This beer is totally boss. It’s right in the wheelhouse of imperial stouts that I really like best. It’s not cloyingly sweet and it has the roast that I crave, while still being very complex. The higher than normal level of carbonation is also nice. In summation: go get this, because it is awesome. That is all. Posted in Tasting Notes.Tagged Boulevard, boulevard brewing, boulevard dark truth. The key demographics, they get me. I’m a big hit with males 18-34. I’m a big fan of Boulevard- Herr Hordeum lives nearby and sent me a bottle of their Double Wide IPA which was excellent, and has also reviewed their Harvest Dance Wheat Wine, Seeyoulator Doppelbock, and Bourbon Barrel Quad (BBQ). This beer sounds quite boss as well. I tried this beer once before and had a hard time finishing it- I am curious if I got a bad batch. The one I had was like a Belgian/sour/imperial stout. It was interesting for the first few sips, but drinkability was zero. After reading some others’ thoughts, I wonder if it had some infection. Hordeum: It does say Belgian yeast on the bottle, but for me that characteristic mostly came through as dried fruits that paired with a roasty stout. Almost like a dried version of say a cherry stout or something like that. Your beer may very well have been fine and this could just be a matter of taste. Boulevard has suffered from infection issues before. Previous Post LAGUNITAS BREWERY IS THE BEST. PERIOD.